Today’s financial service providers operate almost entirely online, and every single transaction and penny transmitted creates hundreds of data points…. Today’s financial service providers operate almost entirely online, and every single transaction and penny transmitted creates hundreds of data points. These massive amounts of data can be incredibly valuable when properly processed, scrubbed, and analyzed. Most importantly, they can help financial services providers make smarter, faster decisions that are backed more by data than intuition. Even so, it’s important to know which data is valuable to track, and the best ways to measure it. The foundation of most smart financial dashboards is a clear understanding of the metrics and key performance indicators necessary for discerning important insights. More importantly, the process to finding the right uses for big data begins with understanding where your data comes from, and how you can measure it best. Creating a powerful financial analytics tool begins with knowing your data sources and identifying the right ways to track them. Data comes from a variety of channels and can prove useful for different types of analysis and metrics. 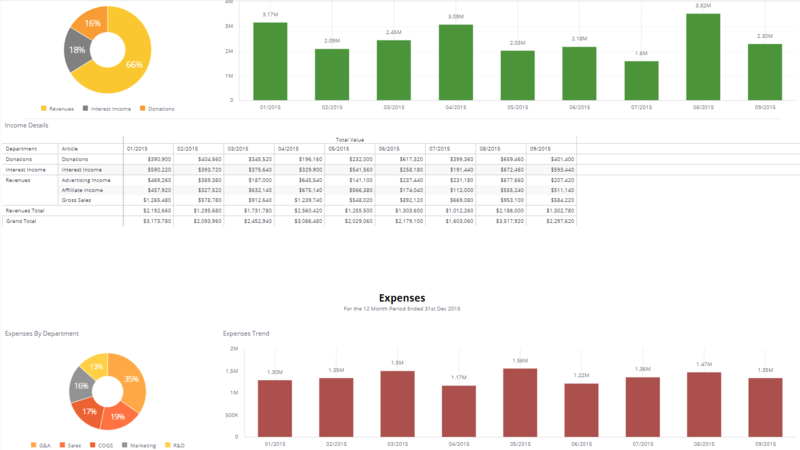 Expenses and Revenues – Regardless of the specific services you provide, every company has overheads and revenues that provide important historic and trend data. This data can include payrolls, income from transactions, operational costs, and fixed costs such as leases, utility costs, and debt payments. Transactions – Volumes of transactions alone are not a reliable measure of a business’ success. A series of investments that cost more than they earn isn’t made better with bigger numbers. Transaction data can display the cost of every deal or investment as well as its margins. Periodic Financial Data – For financial services companies like investment funds, banks, and lenders, understanding growth over time (with measures like cumulative annual growth rate) is crucial for updating investment and lending strategies, as well as building new ones. Shareholder Data – This stream includes information about shareholders’ benefits, dividends, and earnings. Information about dividends paid as a percentage of profits, earnings per share, and even the value of shares provides useful data for making major financial decisions. Debt Data – For most financial services providers, client debt can represent both an asset and a liability. Lenders must keep track of outstanding debts, paid ones, and interest rates. It is also an important consideration when making investments, expanding, setting future strategies and lending levels, and understanding the impact of transactions and loan decisions. Profit & Loss – Profit and loss (P&L) visualizations help build your understanding of profits and costs on an historic basis. This allows you to track real-time changes and measure the impact of strategy changes and new policies. Moreover, P&L visualizations help you identify where profit margins can be widened and which areas of the business are more profitable and valuable relative to others. Loan Volumes and Outstanding Loans – Visualizing the number of outstanding loans helps providers form a better understanding of policy efficacy and which customers are more likely to pay on time. Interpreting the number of loans can indicate consumer preferences and possible areas for heightened profitability. Comparing it to outstanding and delinquent loans can help highlight the effectiveness of underwriting processes and loan extensions. Investment Portfolio Performance – Most financial services providers keep their funds in a combination of cash on hand and diversified investments. Tracking investment portfolios’ performances can help you allocate resources to optimize profits while concurrently advancing better liquidity and financial stability over the long-term. It can also highlight under-performing assets and lead to better reinvestment decisions. Relative Income Per Customer Type – Banks, lenders, and other financial services providers cater to a variety of customers and needs. Understanding each revenue stream’s profitability helps companies make better decisions about which customers to pursue more aggressively and where to allocate more resources. Additionally, it can highlight trends among customer types for services such as loans and mortgages. 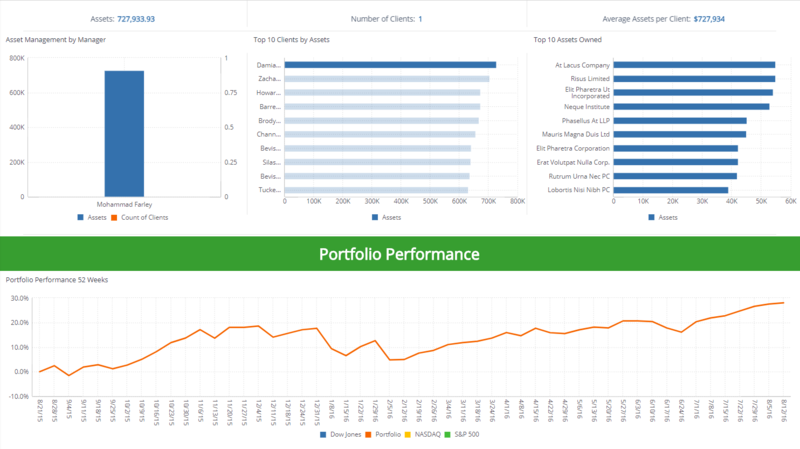 The best financial services dashboard includes both high-level and granular visualizations that provide a fuller picture. By understanding how specific areas are performing (such as outstanding loans, income per customer type, and more) in conjunction with broader data such as P&L and CAGR, you can make smarter strategic decisions and allocate your company’s resources in a manner that leads to operational and profitability optimization.